This was a seriously good book. Before I received it I didn't know a lot about Marcus Samuelsson. I haven't watched any of the seasons of Top Chef Masters, and I missed season 7 of the regular Top Chef (which is when he appeared as a judge), so my awareness of him as a chef has been name recognition only. I'm very glad that has changed with reading this memoir. Immediately upon finishing the first chapter, I started checking the copyright page, "about the author" paragraph, and author's note to see if he had written the book entirely on his own or with a ghostwriter. Less than 5 pages in, I was that struck by the writing. After brief Google searches I still can't be sure, but I suspect that the acknowledgment of Veronica Chambers 'helping to tell his story' and 'the fine touch on the words being all hers' tells the reader that she was a big part of the writing. Either way, whoever was involved should be proud. About six or seven chapters in, I was told that I was reading with a very expressive face. Smiling gently most of the time, occasionally furrowing my brow (I can only assume this was as I read a scene that took place on the playground). That has to be because the story of Samuelsson's life is truly fascinating and strangely accessible, considering how vastly different it is from my own experiences. In tone Yes, Chef reminds me a bit of Jacques Pépin's The Apprentice: My Life in the Kitchen, which is a real compliment from me. Both memoirs show the same respectfulness toward family and kitchen staff, the same underlying sense of humor, and the same gratitude, optimism, and hard-working sensibility. One of the things I enjoyed most about Pépin's memoir was his humbleness and focus on the positive things in life, the ways he'd been fortunate. Samuelsson showed the same traits here. 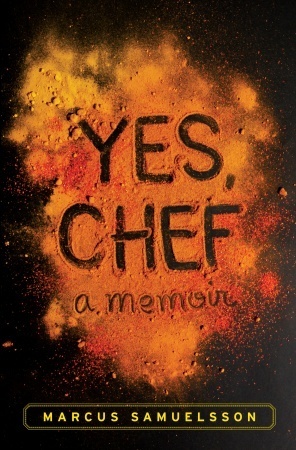 I have no idea why someone would read a chef's memoir if they weren't interested in food, but for those of us who are: don't worry, there's plenty of gastronomic talk to satisfy most any foodie. I was especially pleased because there is so much discussion of dishes and flavour components of various countries and cultures around the world, which is wonderful. Most chef memoirs seem to focus on French cooking nearly to the exclusion of all else. While I understand that French traditions are the backbone of most restaurant work in the West, and I believe French food has a strong place in the culinary world, I don't believe that place is the only place. I'm also a big fan of holding your head high enough and keeping yourself to a high enough standard to not feel the need of calling out your detractors in print when writing a book about yourself. Yes, Chef does not avoid this trap entirely. There are two professional clashes that are discussed, but the persons involved are not insulted and enough positive had been said about them in the previous mentions of them that it comes across not as a spiteful hit, but as a needed explanation of why those professional clashes happened. The incidents in question could not have been left out, so they were written about in the best way possible without attacking, and I appreciate that Samuelsson acknowledged his own responsibilities instead of placing all blame on the other involved parties. The only person truly called out in the entire book is a celebrity chef who conducts himself publicly in a style that I don't personally care for, so I can't be annoyed about seeing him taken down a peg. Even in that case, Samuelsson let the other man's words speak for themselves. I live with enough privilege to have never thought of food careers as an arena where race would be a particular issue. My experiences growing up in California have been such that the idea of a professional kitchen being almost exclusively white chefs and Latino line cooks seems ridiculous (when I eat shawarma, qorma, adobo, mole, udon, mochi, tajine, phat thai, tandoori chicken, etc., I don't expect those restaurants' kitchens to be full of white faces, and in California those items are more available to me than coq au vin). I had my eyes opened to prejudices that still exist in the cooking world, and I appreciate that Samuelsson discussed it in a way that was clear and honest about the effect on him, but without changing the tone of the book from that of a story about a Chef who is black to a Story About a Black Chef. Race has been a factor in his life and his career, but it is not the entirety of the story, and I'm grateful that it wasn't written as if it were (though the last two chapters did start to get that way). The quality of the book broke down suddenly and strangely for about 17 pages a few chapters before the end. Anecdotes that weren't relative or interesting were forced in with a shoehorn, then left lying there with no follow-up or reason for being. The writing through this section was choppy and backed me out of what I was reading, as I flipped backward and forward to see if maybe I'd accidentally skipped a page. It was this section that also made me think the book might be better off as a whole without titles to the chapters. Most of the chapters' content related directly to their titles, but others only tangentially or only 2 pages out of 10. The last two chapters were a lot of "wrapping up" language. They mused, felt nostalgic, and seemed to be trying to impart a lesson, when there was still more story to tell. It's unfortunate that this departure from the feel of the rest of the book is what the reader is left with, walks away with, as it's not the supremely enjoyable experience I had from the first 270-some pages. Fortunately it's not bad enough to dispel the good feeling, and I definitely feel good about recommending the book overall. As for me, I'm now off to watch Top Chef Masters Season 2, so I can see the man in action! I received this book as an uncorrected proof "Advanced Reader's Copy" through a giveaway, from Random House, with no obligation to review or recommend.